"This is a delicious variation on a classic made with the light and heavenly Italian Christmas bread. Panettone is similar to brioche but studded with raisins and candied orange and lemon peel. A luscious sauce made with orange liqueur, makes this dish perfect for the holidays. Serve as a dessert or a sweet and decadent breakfast." Arrange the panettone bread cubes to fit compactly into a buttered 2 quart casserole dish. Do not compress too tightly; set aside any leftover bread cubes. Whisk together 3 eggs and 1/2 cup sugar until the sugar is dissolved and the mixture becomes light yellow in color. Pour in the cream, vanilla, and 1 tablespoon orange liqueur; whisk to combine. Stir in 1 pinch salt, 1/8 teaspoon nutmeg, lemon zest, and orange zest. Pour this mixture over the panettone cubes in the casserole dish. Cover and refrigerate for 30 minutes. 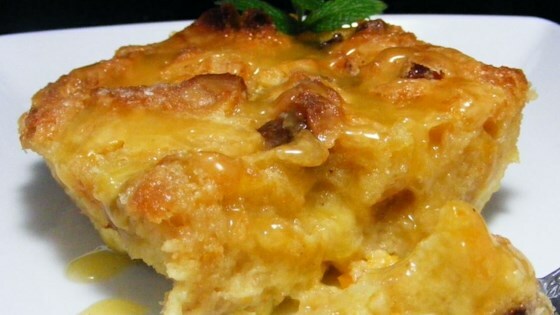 Remove the bread from the refrigerator, uncover, and dot the top of the bread pudding with 2 1/2 tablespoons butter, and sprinkle with 2 tablespoons of white sugar. Set casserole dish into a shallow pan that is 2 to 3 inches larger in diameter than the casserole dish. Set these pans onto the center rack of the preheated oven. Pour hot water into the outside pan, until it reaches a depth of 1 inch around the casserole dish, creating a water bath. Bake the pudding in the water bath until it is fully set and a knife inserted into the center of the pudding comes out clean, 1 to 1 1/4 hours. The water bath will help the pudding to cook evenly and maintain a light texture. Carefully remove the pudding from the water bath and cool for at least 15 minutes before serving. Just before serving, make the sauce by melting 1/2 cup butter in a saucepan over low heat. Stir in 1 cup sugar, 1/4 cup orange liqueur, 3 tablespoons water, 1/8 teaspoon nutmeg, and 1/8 teaspoon salt. Stir and heat over medium heat until the sugar is fully dissolved and the liquid is heated through. Remove from heat. In a small mixing bowl, whisk 1 egg until well beaten. While whisking the egg, slowly pour 2 tablespoons of the hot mixture into the bowl with the egg. Then, while whisking mixture vigorously, slowly pour the warmed egg mixture back into the sauce. Place the saucepan back over low heat, gently stirring the sauce and raising the temperature slowly to medium. Continue to stir until the sauce almost reaches a simmer, reducing the heat as necessary if the mixture threatens to boil. Continue stirring until the sauce thickens, 1 to 2 minutes. Spoon over the bread pudding and serve immediately. Total temptation and complete comfort invite your enjoyment. This recipe is so wonderful. Panettone certainly is the perfect bread for bread pudding. I also use it Christmas morning to make french toast with our leftover egg nog. If I could give this recipe more stars, I would! I baked this for guests, followed the directions exactly, and ended up with the most heavenly bread pudding ever. Definatly make this one. The best bread pudding ever! I omitted the butter and sugar on the top but none the less, perfect. If you haven't tried panettone your missing the best sweet yeast bread ever.